Almonds are packed with healthy fats and protein and have been known to reduce blood pressure and maintain healthy cholesterol levels. It has also been said that a handful of almonds is just as effective for headaches as aspirin. A handful of almonds contains around 150 calories, 12 grams of healthy fats and no cholesterol. Whole oats are rich in soluble fiber which can help lower levels of “bad” cholesterol by reducing the absorption of cholesterol into your bloodstream. Studies show that eating a diet full of soluble fiber may help reduce the risk of developing coronary heart disease, skin sensitivities, and constipation. Have a half cup of rolled oats for breakfast and top it with maple syrup, honey, antioxidant-rich berries, or any fruit of your choice! 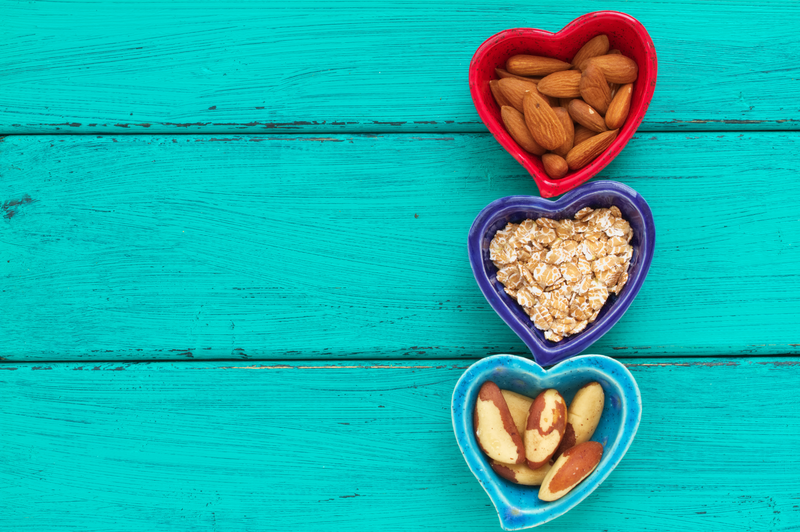 Studies show that eating just 1-2 Brazil nuts per day can help maintain healthy cholesterol levels, lower the risk of cardiovascular disease, and improve overall heart health. The selenium in Brazil nuts have also been shown to improve mood and balance emotional health.